Gnocl -the Tcl/Gtk Bindings: gnocl::splashScreen -done! 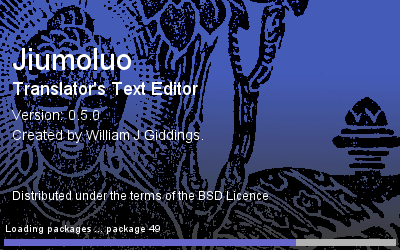 Well, this is the first screenshot of the new gnocl::splashScreen widget. Its effectively up and running and I only now need to add a little more code to refresh the progress bar. Although it's a test script, the sample layout is the one I use for my own pet project, Jiumoluo, a customised text translation tool. $ss push "Loading packages ... package $i"